The Balance Sheet of Manufacturing Companies are usually presented with the least liquid Assets first and on the Liabilities side with the least liquid Liabilities first. Financial services companies on the other hand present the most liquid Assets and Liabilities first. The main headings Assets, Liabilities and Equity have been explained in Part 8. Below we will explore the meanings of some of the non-obvious terms. As terms such as cash, overdrafts, loans etc. mean the same as in ordinary use. Current Assets include cash and other assets that can be converted into cash or used up within a year. Examples of Current Assets include Cash and Cash equivalents, Prepayments, Accounts Receivables and Inventories. Prepayments are costs paid in advance mainly to suppliers of goods or services. Accounts Receivables are amounts owed to the firm by customers for goods or services sold on credit. Inventories are goods held for sale to customers or used up in making goods to be sold. These can be further categorized into Raw Materials, Work in Progress and Finished Goods. Non Current Assets are assets that will not be converted into cash or used up within a year. These assets form the foundation from which the firm operates. Examples include Property, Plant and Equipment. Accounts Payable are amounts owed to suppliers for goods or services purchased on credit. Non Current Liabilities are obligations that will be due after a year. An Example is Long Term Loans. The main items under Equity are Share Capital, Share Premium, General Reserves and Retained Earnings. The Share Capital (or Issued Share Capital) is the number of shares issued at par value which is the amount contributed by the shareholders. The par value of a share is a stated or legal value usually 50 Kobo or 1 Naira. The difference between the price at which the shares are actually sold to the par value is the Share Premium. the number of shares that may be sold under the firm’s articles of incorporation. Retained earnings are the cumulative net earnings since the firm’s inception that have not been paid out to shareholders as dividends. The Balance Sheet can be used to analyze the firm’s capital structure, solvency (ability to pay long term obligations), liquidity (ability to pay short term obligations) it’s ability to pay dividends to shareholders and its general financial health. 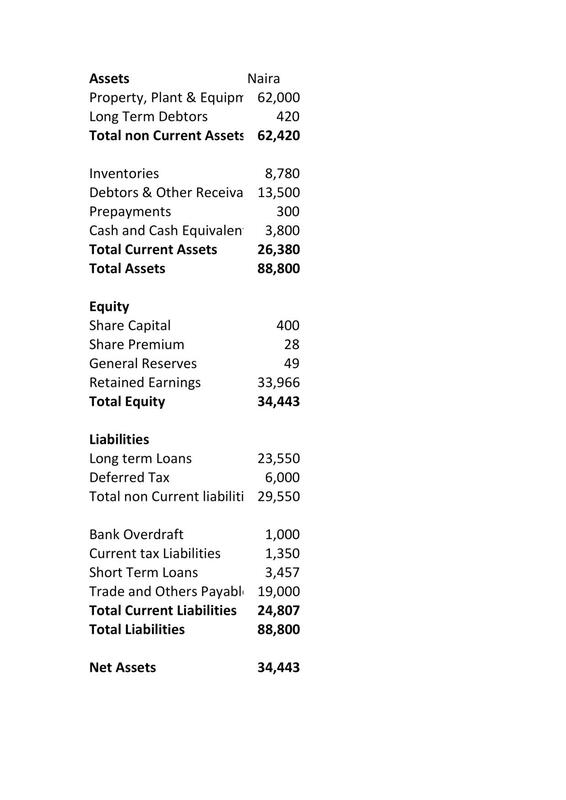 In the next part, we will examine the Income Statement of a manufacturing company.